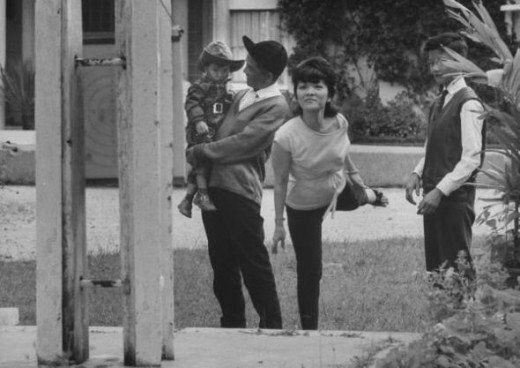 Recently, LIFE Magazine released many of their historical photos in digital format. 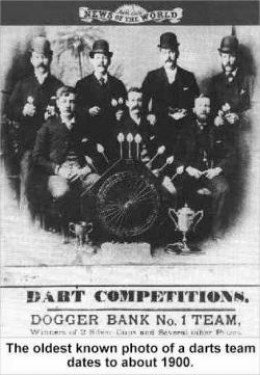 Their photos gave me the inclination to start collecting Historical Darts Pictures along with other treasures I come across, hopefully providing dart players and darts enthusiasts with an entertaining look at the early days of the sport we love to play. 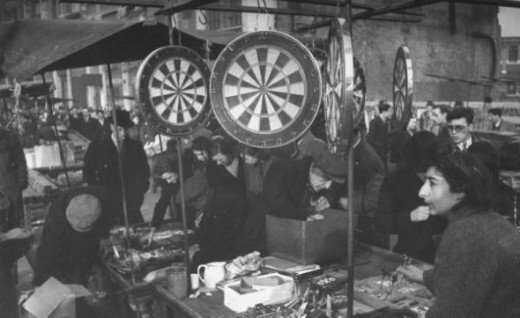 Dart boards and darts for sale in the Petticoat Lane Free Market. – © Time Inc. Check out the guy wearing the cool motorcycle goggles. Think they help him focus on the dartboard better? I am curious as to the makers and styles of darts they had to offer! 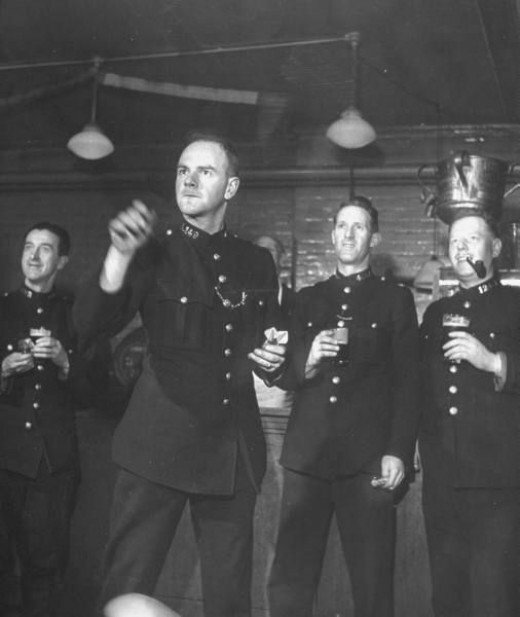 Off duty policemen enjoying beer and a game of darts in the canteen bar below the Cannon Row police station. – © Time Inc.
A bar below the police station. I guess you’d feel safe from harm, and under the eye of Johnny Law all at the same time! I like the look of determination on the shooters face. Cannon Row Police Station was one of the Metropolitan Police’s more famous central London police stations and formed part of the famous New Scotland Yard building designed by Norman Shaw. 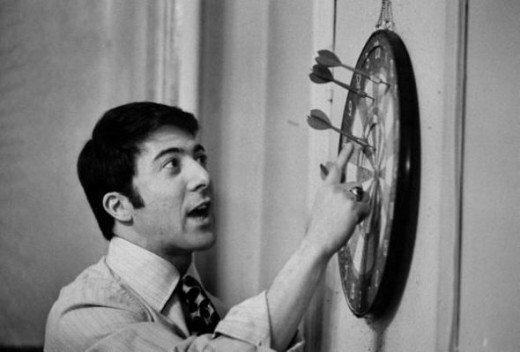 Actor Dustin Hoffman playing darts. – © Time Inc.
As you know, Hoffman later played Raymond Babbit in the movie Rain Man, earning himself an Academy Award for Best Actor and a Golden Globe. If you’ve seen the movie you can only imagine how awesome Ray would be at calculating checkouts at the speed of light. Din Nhu Ngo playing darts with family in Dalat Villa Garde. – © Time Inc. I couldn’t find any information on Din Nhu Ngo, much less where Dalat Villa Garde is. In fact Google didn’t even give me any suggestions, it just said “are you so retarded you can’t type!?!?”. But it sure looks like a fun time enjoying the outdoors while throwing a few arrows, and the shooter sure looks like a wonderful lady to enjoy that with. 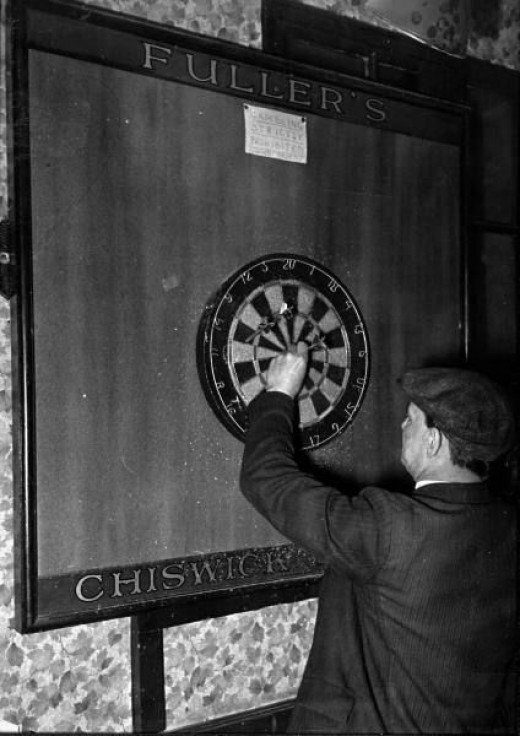 A man removing his darts from the dartboard as he prepares for another game in an English pub. 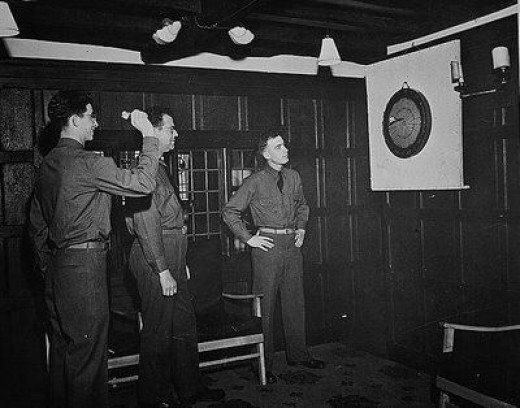 – © Time Inc.
Eyeballing this and considering the bullseye is 5′ 8″ from the floor, I’d have to guess either this shooter is rather short or maybe this dartboard was not setup to the regulations we use today. 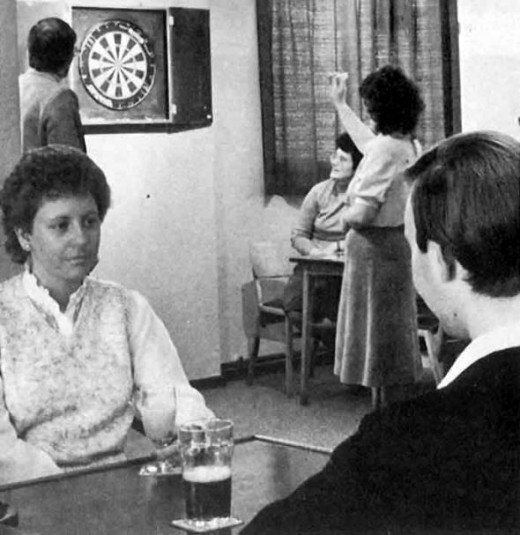 I’m sure somewhere – maybe Patrick Chaplains web site – there may be an answer to the dartboard setup throughout history. 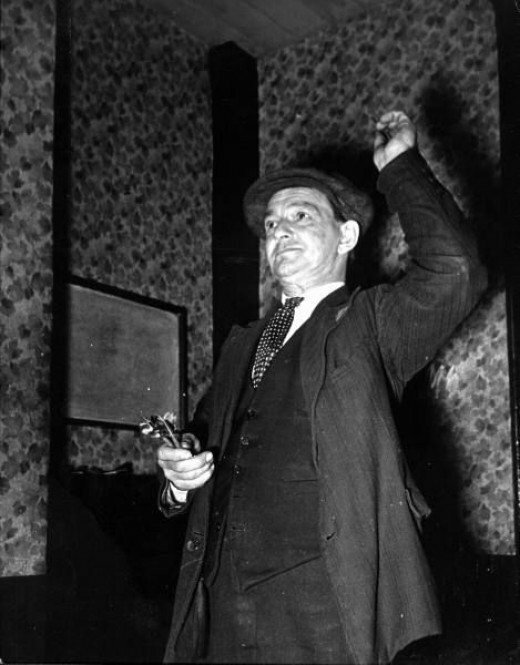 A man drawing back his arm to throw the dart, while playing in an English pub. – © Time Inc.
Of course, in this picture he looks like a pretty tall dude, or his opponent has had a pint too many and is taking the picture from the “floor position”. 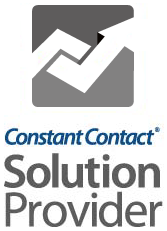 This one I found on a web site that had no text or mention of who, what when and where. Just a list of pictures. In the photograph file name it is tagged as 1950. Update: I received this message from George Haines, thanks George! I have the info about the photo you have posted from Pennsylvania. I Know The Shooter’s Name Is John Petro. This 1950 Photo Was Taken At The White Swan Bar In Hoban Heights, PA! The Bar Was Owned By The Ignatovich Family From Duryea, PA. I ran across this one on a blog, which only mentioned darts in one paragraph and never referred to the photo. The way these shooters are dressed makes me wonder if they were in the military. Judging from the lights and furniture, maybe the late 60’s? I ran across this gem on an 81 Squadron memorial web site. The Wikipedia entry tells an interesting story of this Squadron, and I think the pic tells an interesting story as well. This one is quite interesting! It appears as though this giant of a manufacturing plant included darts as an on site activity for employees. Industrial equipment for the food, chemical and printing industries was designed, developed and manufactured at Westwood Works for nearly 100 years. During that time, it produced machinery that makes enough biscuits every year to encircle the world, bakery plant that produces the loaves, rolls and cakes bought by shoppers on every continent, equipment to make chocolate confectionery and sweets by the tens of thousands every hour, printing presses to print colour magazines and wrappers for the food on the supermarket shelf, and machines for the foundry and chemical industries around the world. Approximately 3,000 dedicated engineers, craftsmen, designers, process technologists, administrative staff, computer operators and salespeople worked here to create the biggest and most prestigious supplier of such equipment in the World. 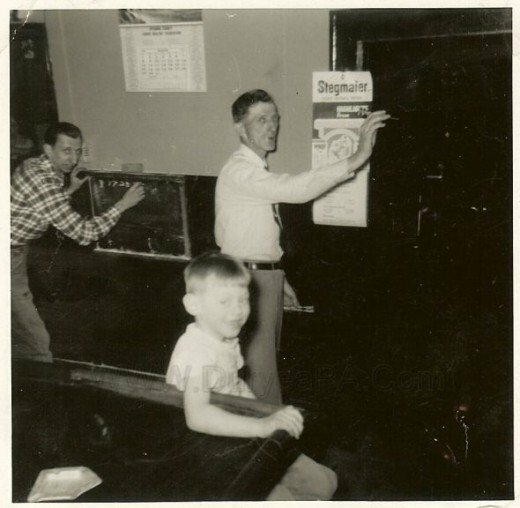 The Oldest Darts Picture Ever? 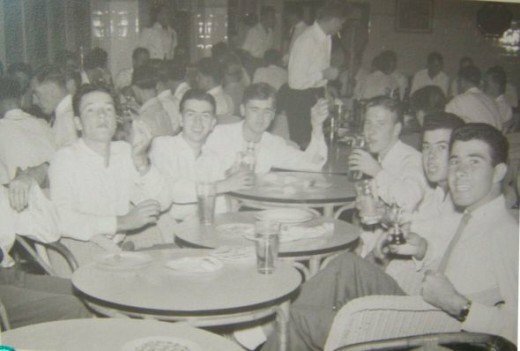 I ran across this one which is tagged as the oldest darts pic known of. Your guess? Do you have any info on the pics posted on this lens? 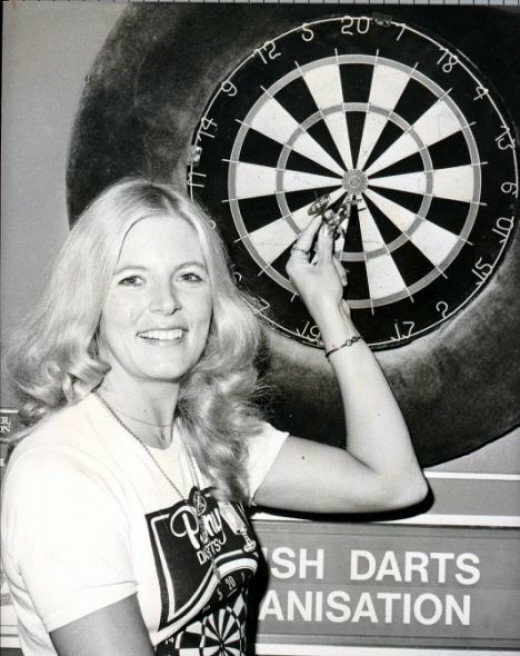 Do you have any historical darts pictures to share? Let me know! Believe it or not, the dartboard setup specs are something I find players looking for often. Here are the details. I hope this has been entertaining for dart players somewhere, in some way. I’m happy to share the treasures! 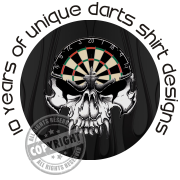 Bookmark this page or subscribe to My Dart Shirts Newsletter to check in on future updates.